Looking for a fun way to get kids interested in sewing? 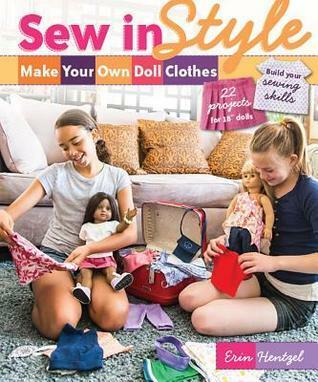 Sew in Style Make Your Own Doll Clothes by Erin Hentzel is the perfect book for aspiring designers and stylists who are just getting started with sewing. With a focus on creating doll clothes for 18 inch dolls, this book has 22 fun projects, and will help kids build on their sewing skills. With step-by-step tutorials and basic sewing lessons, kids will be able to easily follow along and start sewing right away. Kids who are in the pre-teen or early teen stages still love playing with dolls – even if they don’t want to admit it. With Sew in Style, kids can make their very own 18 inch doll clothes. Whether it’s American Girl, Madame Alexander, Dollie & Me or OG Dolls, this book will help kids create their own collection of clothing for their favorite dolls. One of the great things about this book is that it teaches readers basic sewing skills. If your child is still new to sewing, he or she can learn a lot from the basic lessons provided in this book. And if you’ve been trying to teach your kids how to sew but haven’t had success, the author’s easy-to-follow teaching style may be just what you need to get your kids interested in and succeeding at sewing. So, if you want to sew in style, then you definitely have to read the book. The author, Erin, explains everything in a very straightforward, easy-to-understand manner – which is so important when teaching kids how to sew. The easier the instructions are to understand, the easier it will be for kids to follow along. If kids can create fun projects they love with relative ease, they’ll grow to love sewing. The basic tutorials included in this book will get kids started on the right foot. Aside from basic instructions, Erin also includes step-by-step tutorials with photos, so kids can learn how to complete projects with ease. The photos are a nice addition because some kids are visual learners. And when it comes to sewing, it’s often easier to see what the instructor is talking about, rather than just reading a list of instructions. Erin does a great job of covering both learning styles, so readers of all levels can benefit from the lessons in this book. Parents and grandparents will appreciate these tutorials because it makes lessons easier to understand. Click here to find more sewing books we recommend for kids and beginners. What’s the most important part of this book? The 22 fun projects that Erin includes. From skinny jeans to yoga pants to messenger bags, the author includes a variety of different stylish and fun projects that kids will be eager to make. If you’re concerned that some of the projects may be too difficult for your child, don’t be. Erin includes projects for all skill levels, so all users can join in on the fun. Naturally, all projects are designed for 18” doll clothes, and full size patterns are included. The included patterns will inspire kids to create their own designs, and improve on their sewing skills in the process. The only negative thing I will say about this book is that it may be a little too difficult for very young sewers (think 6 or 7). With that said, if you’re supervising the child and don’t mind supplementing the lessons, even very young sewers should be able to follow along. Sew in Style is the perfect book to add to your collection if you’re hoping to teach your kids how to sew. It can also make a great book for any adult who is just learning how to sew and wants easy projects to get started. Whether you’re young or old, a novice or an advanced sewer, you’re sure to love the projects in this book if you’re a fan of American Girl or other 18” doll collections.